Living on an island in the middle of the Salish Sea helps set a mood and a mindset. 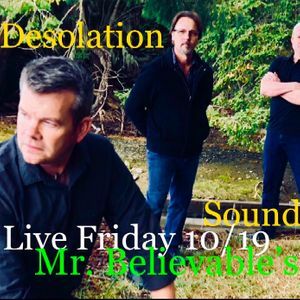 The band Desolation Sound calls their music Salish Rock, "It's the sound of fender amps and the Salish Sea" pronounces Daniel Day, the bands main songwriter. "We have many gloomy days when going into to rehearsal space and creating is very appealing to us". The band was born on San Juan Island in 2018 and consists of good friends Daniel Day on vocals and guitar, Darvis Taylor on Bass, keys, backing vocals and engineering, and Scott Sluis on drums, percussion and backing vocals. Our first recorded music is here. It is a five song E.P. entitled "Adam" in honor of our incredibly talented and legendary producer; Adam Kasper. We'd like to get to know you. Welcome to our scene.